I used to spend Friday nights, or Saturday pre- yoga, or the occasional soggy Sunday morning making “treats”: something special for breakfast. Banana bread (a Friday night favorite), sticky buns (the best take two days), morning buns, chocolate croissants with leftover puff pastry dough (Sunday! ), Sour Cream Pancakes (Sunday, too). Weekdays were for yogurt and granola and hard boiled eggs. At some point this fall I suddenly realized this made no sense. Monday is the day we all need a little tenderness. Something to soften the ease back to the rush of the working week, time to recognize the coming separation. A little something to compensate for a little sleep debt. Some Sunday evenings I stir up a batch of oatmeal. We nurse it through the week, adding a little milk or water as needed to warm and moisten (we don’t have a microwave). 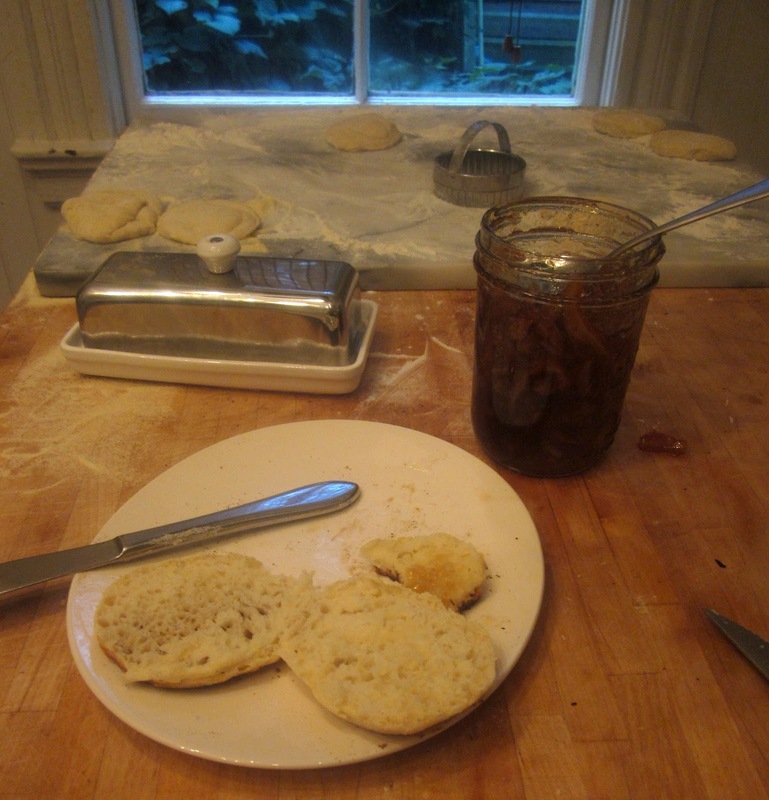 This Sunday we were behind in our bread-making rhythm-- toast and salmon is another standby for breakfast around -- so I decided to try this recipe for homemade english muffins. But I don’t have a bread maker, and I punched it down after the first rise... maybe 3 hours? and refrigerated overnight. Unbelievably, it rose again in the fridge, and because I got my skillet piping hot,my muffins “popped”, and I had the store-bought-ish number of nooks and crannies (vs.what the recipe and comments describe). Meanwhile, I’ve bee nursing a bucketload of seville oranges into marmalade. And so this morning we had the blessing of hot homemade muffins with fresh homemade jam. It was the most heavenly breakfast I’ve had in awhile, and a very soft opening to the week. Add the yeast to the milk, and then combine the ingredients, in order, in a bowl. Mix after each ingredient, at the end you should have a shaggy, loose dough. Cover with a cloth and place in a warm spot until double. Punch down and refrigerate, or allow to rise again for 1-2 hours. On a lightly floured surface, roll the dough out it until it's about 1/2-inch thick. Cut out circles with a floured 2.5-inch cutter. Re-roll and cut out the leftover dough (I ended up with about 20 muffins). Let rest for about 20 minutes. Sprinkle the muffins with cornmeal or semolina. Heat a cast iron pan until just below smoking, add 5 or so muffins (cornmeal side down), and reduce heat to medium. Cook for 7 minutes, flip, reduce heat further if needed, and cook for 3-4 minutes. Wash the fruit and add it and the water to a larger nonreactive pot (le crueset is great). Bring to a boil and simmer for 1 hour or so, until the fruit is easily pierced with a fork. Allow to cool overnight. You want the water, so just stick the whole pot in the fridge. Slice the fruit thinly, removing and reserving the seeds. Wrap the seeds in cheesecloth. Remove 1 cup of the water, and discard. Replace with the cup of fresh squeezed orange juice (from juice oranges, not sevilles). Add the cheesecloth-wrapped seeds, and bring to a boil. Boil for 10 minutes. Add the sliced fruit to the pot and return to a boil. Stir over a gentle heat until it is disolved, then boil up rapidly, without stirring, for about half an hour, or until setting point (approximately 220 degrees). Pour in jars, let sit for about 30 minutes before covering or boiling.